Broadcast journalist and weather presenter Reham Khan (well-known to BBC viewers and listeners in the south of England) occasionally likes to present her friends, acquaintances and aficionados with interesting intellectual challenges. She recently posed the question, ‘Using drugs for entertainment or relaxation is a sign of a psychologically disturbed individual. Do you agree?’ She did, of course, receive a number of responses of various flavours. Though I am not professionally or personally qualified to answer her question, I made an attempt anyway! What interests me, though, is that Reham’s question taps into a whole range of assumptions. Her question has certainly made me aware of some of mine. Without thinking about it, I interpreted the term ‘psychologically disturbed’ in a negative light. I saw it as pejorative. To me, then, the question appeared to be asking whether recreational drug use was equated with some sort of personal moral shortcoming. Needless to say, Reham was not suggesting any such thing. It was only after I pondered the question again later that I realised my mistake. I had interpreted the expression ‘psychologically disturbed’ in a judgemental way. In my defence, however, I would like to say that I don’t think I’m alone in making this error. There is a very long social history of seeing psychological disturbance (however it is defined) in negative terms. Sufferers of its more problematic manifestations have often been placed in institutions as ‘punishment’ for their conditions, or they have received other forms of apparently punitive attention. What is especially disturbing today (psychologically or otherwise) is the quality of public discourse on the subject of these conditions. This has been prompted by current economic considerations. In the UK, where governmental agencies are seeking ways to reduce the cost of welfare, people with psychological disorders (and physical disorders) are finding that their claims for financial support are now being rejected. Where medical professionals used to assess the validity (or otherwise) of such claims, lower-paid administrative staff are now making the required judgements. If a claimant doesn’t use the exact words or phrases on the administrator’s check-list, his or her claim is rejected. Rejection is a consequence of judgement. For some people who have to live with very challenging conditions, the rejection of a claim for benefits can read like moral disapproval. In such cases, not only is psychological disturbance equated with failure, it isn’t even seen as a worthy failure. And this feeds into the perception given by the popular press, and adopted by some members of the public, that the psychologically disturbed are shirkers who want to get something for nothing (even where they happen to be economically active, but need their incomes supplemented due to special needs). I am not suggesting that this is actually happening, but given the current public discourse surrounding psychological and mental health problems, it wouldn’t be at all surprising if some people did indeed turn to recreational drugs for entertainment or relaxation – after all, it’s not as though they would be judged any more harshly. Words are weapons, and I would suggest we need to change the words we use and the way we use them. The bigger challenge, though, is to change our attitudes. Psychological disturbance is not immoral, but it is very common. Let’s start treating it as part of our shared human condition, rather than as something to be condemned. On another note, it is now one year since my book Delivered Unto Lions was published in paperback. In celebration of this one-year anniversary, a new eBook edition is about to be published. More details on that to come. In the meantime, if you are a new visitor to my blog, Delivered Unto Lions can be summarised as a factually-based novel inspired by my own experience as a child psychiatric in-patient in the 1970s. It is not just (a version of) my story, however, as it represents the terrible traumatic experiences of many children and teenagers caught up in the mental healthcare system as it was at that time. Actions speak louder than words, or so the saying goes. As someone who often spends far too much time thinking about such things, I sometimes find myself wondering if actions and words are really very different. Both are forms of communication which actually do things in the real world. If I pick up a hammer and drop it on your toe, that does something. If I then turn to you and say that you are a waste of space, and it’s your own fault that the hammer landed on your toe (because you were in the way), then that also does something. We have intentions when we say things. We expect our words to achieve something. Indeed, there are many philosophers, sociolinguists, and other academics, who have put a good deal of effort into determining what words do, and how they do it. John L Austin, for example, is a name especially associated with speech-act theory. This theory emphasises various aspects of speech, and one of them is the actual effect that words have, whether it is the effect of persuading, inspiring, frightening, or making something else happen. These observations are particularly relevant to me as the author of a book related to mental health care. In my writing (rather than speaking, in this case), there are (at least) three things that were going on. Firstly, there was the actual act of sitting down and writing, i.e. turning my memories and reflections into a novel. Secondly, there was the issue of what I intended my words to do, i.e. my aim of drawing attention (in an entertaining way, hopefully) to past institutional practices that I understood as unjust. And thirdly, there was the actual effect that my words had on the people who read them. Naming a disciplinary act as a ‘consequence’ rather than a ‘punishment’ was, no doubt, intended to do something. My guess is that it was an attempted form of behaviouralist conditioning – i.e. you already know the consequence of putting your hand in the fire is a painful burn, so therefore you don’t do it because of the inevitable result; in the same way, the consequence of (for instance) running away is confinement with all your clothing removed, so therefore you learn not to defy institutional authority, because that too has an inevitable result (or so you are conditioned to believe). Consequences, after all, are things that happen naturally, whereas punishments are deliberately imposed. It is also very interesting how people with mental health conditions get labelled, because, of course, labels are also words which do things. 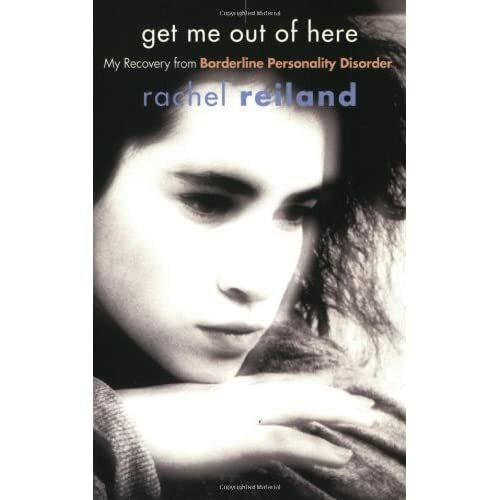 I’m currently reading a book which tells the story of someone’s experience of borderline personality disorder (which I will review here in due course). But the expression ‘borderline personality disorder’ itself represents a form of words with an effect. Some people see these words as having a judgemental effect, as they paint a picture of someone who’s very self (personality) is faulty, existing on a ‘borderline’ between ‘normal’ and ‘psychotic’ functioning. For this reason (among others), there are alternative words that have been suggested to describe this condition, such as ‘emotional instability disorder’ or ‘post traumatic personality disorganization’. As such, these alternative names do alternative things, whether good or bad. Stigma continues to be a major issue for current and recovered sufferers of mental health problems. The words we use can speak just as loudly as any actions. By their strength, words can feed the power of stigma, reinforce prejudice, and prolong suffering; or by their strength, words can reduce the power of stigma, challenge prejudice, and help alleviate suffering. Words, as well as actions, do things in the real world. Perhaps we should be more careful in the words we use so that we make sure they do the right things. D W Winnicott (1896-1971) was a pioneering paediatrician and psychoanalyst who dedicated his life to the field of child development. Adam Phillips’ book, Winnicott (published by Penguin), provides a thorough overview of the man’s life and achievements. I must admit that, until I picked up this book, I knew next to nothing about D W Winnicott. But Adam Phillips (himself a child psychotherapist) corrects that gap in my knowledge with this affectionate – though not uncritical – exploration of a very significant figure in the history of child psychiatry and psychology. Phillips covers Winnicott’s early life, starting with his birth and upbringing in Devon, where he was raised in the non-conformist Wesleyan tradition. Phillips identifies this as noteworthy because Winnicott borrowed from the tradition’s eighteenth century founder, John Wesley, the desire to make his work accessible by using plain language – he did not believe that presenting his message in a popular way weakened it. But unlike Wesley, Winnicott rejected the aim of converting his audience, because he came to see it as a sign of madness to make such big demands on other people’s trust. Given that Winnicott had a preference for plain language, it is regrettable that Phillips’ preface and fairly lengthy introduction are rather dry in style, which may put off more casual readers. Fortunately, his writing style is more easily manageable in the main body of the book (though in quoting the work of other thinkers, he isn’t afraid to repeat what some readers might see as ‘psychobabble’). As Winnicott’s focus was always on child developmental issues, it is more than appropriate that Phillips considers not only the facts of Winnicott’s upbringing, but also Winnicott’s own view of it (as expressed in published comments). For instance, Phillips makes a point of comparing apparent characteristics of Winnocott’s father (e.g. as a potentially humiliating presence) with his son’s positive and justifying view of him. But while Winnicott’s comments on his father gained wide circulation, he published very little about his mother until he was in his late sixties, when he reflected on her suffering of depression. Phillips does not let the reader miss the possible correlation of such remembered experiences with the emphasis on the mother-and-child relationship in Winnicott’s professional work. Phillips places Winnicott’s activity within the context of psychoanalysis in general, as bequeathed to world by Sigmund Freud, and as subsequently applied in connection with children by the likes of Anna Freud and Melanie Klein in the late 1920s. Winnicott, while learning much from these practitioners of the late ’20s, also deviates from them, not least in the way he resists their rigid adherence to their (often opposing) dogmas. One particular chapter especially grabbed my attention. This is the one which looks at Winnicott’s observations about children evacuated from their homes during World War II. In this chapter, Phillips examines how these unfortunate (and damaging) circumstances gave Winnicott the opportunity to learn a great deal about children’s behaviour. It would not have been possible to make the same discoveries in peacetime, as it would obviously have been unethical to remove children from their homes and place them in hostels simply for the sake of research. What fascinates me personally is the parallel between these wartime experiences (and discoveries) and my own interest in the situation of children removed from their homes and placed in psychiatric units (in the post-war years up until the mid-1990s). Also of special interest for me, given how little I knew of Winnicott previously, is how familiar many of his ideas appear. For instance, he sees common childhood symptoms, not as evidence of disorders, but as part of a child’s expression of identity. Such symptoms, however, come to indicate disorders when they continue to be used despite being useless as forms of communication. Phillips particularly refers to Winnicott’s example of bed-wetting. This may represent a child’s protest against overbearing control, in which case it cannot be considered a disorder. But if the bed-wetting fails to communicate that protest effectively, but carries on anyway, then it should indeed be regarded as disordered. So, it is the context of a symptom that determines whether or not there is a problem. Many parents will be familiar with (and sometimes sceptical of) ideas of this kind from child rearing self-help books and parenting ‘experts’ (health visitors, TV child care ‘gurus’, etc.). For me, this book is a useful introduction to D W Winnicott and his work. The author has succeeded in bringing his subject to life on the page, revealing a good deal about Winnicott’s possible motivations, hopes and aims. Given how empathetic and caring a figure Winnicott appears to have been, it is perhaps disappointing that these aspects of his approach were less influential in children’s post-war mental health care than were his theoretical contributions. Over the past few months I have written a good deal on subjects that, either directly or indirectly, relate to some form of human suffering in connection with mental health. My main concern has been with the past suffering of children and adolescents – most of whom have hopefully survived into adulthood – who spent some (or all) of their formative years in residential psychiatric care. From the age of twelve to seventeen, I myself spend some considerable time in a children’s psychiatric unit (it wasn’t a single continuous stay, but it certainly dominated that part of my life). It was a very unpleasant experience, but I freely acknowledge that I was very fortunate compared to some of the other young people I knew during that time. Back then (from early 1976 to late 1980) I witnessed a good deal of mental distress in others that put my own difficulties into perspective. Needless to say, in that situation, much of the suffering in question was directly caused by the very reason for admission to a psychiatric unit in the first place. Those young mental patients suffered with a variety of problems, from depression to eating disorders, from neuroses to psychoses. But there was additional suffering for some of those kids. This was the result of separation from, or rejection by, their families, plus occasionally punitive and unjust treatment at the unit. But there is another kind of suffering on my mind as I write this. The people of Japan are very much in my thoughts at the moment, as that country was hit by a devastating earthquake on Friday, 11 March 2011. Today, the following Monday, the scale of human suffering in the wake of that event is becoming more and more difficult to take in. How are we to deal with the issue of human suffering? How are we to compare suffering on a relatively small scale, such as that experienced in a 1970s children’s unit, with that on a much larger scale? Some [people] are appalled by the total, vast extent of evil and suffering. It is true, of course, that no one person can experience it all. If twenty thousand people suffer and die from cancer of the lung there is no one person who can suffer more than his own individual share of pain. No one can die twenty thousand deaths. The reason I bring this up is because it deals with perspective, and also because I believe all suffering matters. It may be one person’s suffering, or it may be thousands of people’s suffering. Recovery may take place in just a few days, or it may take years (or, very sadly, recovery may be impossible). The point is that suffering is still a tragedy, no matter what the scale. This is not a competition. If you’ve been hurt or damaged, then that still matters, and working towards a better future for yourself and those close to you is important. There may be others who are suffering more, and you can empathise with them and help them if you can; but that does not devalue your experience. My thoughts are very much with the people of Japan, but they also continue to be with those young people I once knew all those years ago. If the thought can translate into practical attention (however small), and if concern can translate into hope (however small), then I'm sure those thoughts and concerns are worth having. Having read one perspective on schizophrenia, in Henry’s Demons by Patrick and Henry Cockburn, I decided to investigate another point-of-view, and one that particularly made reference to childhood and adolescence (though onset of schizophrenia in childhood or early adolescence is comparatively rare). And so I found myself reading Me, Myself, and Them by Kurt Snyder (published by Oxford University Press). Me, Myself, and Them is Kurt Snyder’s own account of living with schizophrenia, an experience that began for him at the age of 18. But his account is supplemented by observations from an academic in the field of psychiatry, neurology and radiology (Raquel E Gur) and a journalist specialising in mental health issues (Linda Wasmer Andrews). Kurt looks back to his childhood, and although he identifies two unfortunate incidents which overly preoccupied him for some considerable time, it seems he was a relatively happy, if reserved, child. It was at the age of 18, shortly after having begun an engineering degree course, that symptoms of schizophrenia emerged. He started to believe he was a genius on the verge of a major breakthrough in mathematics, but the breakthrough eluded him, and so he began to feel he simply wasn’t thinking hard enough. But he also became forgetful, disorganised, and very paranoid. Not surprisingly, his college work suffered. Kurt’s symptoms intensified after dropping out of college and pursing work in general maintenance. As he tells his story, the reader is allowed into his world of fear, where hostility appears to lurk behind every corner, and where he believes his every movement is being watched. And these symptoms are contextualised in a useful overview of the different varieties and manifestations of schizophrenia. It is hard to find anything much to criticise in this book. If I have one very minor criticism, it is that more hasn’t been done to address the issues of stigma and stereotyping in connection with schizophrenia. These issues are not ignored, but they are dealt with rather fleetingly towards the end of the book. My own feeling is that these are very important matters that should have been raised earlier, and dealt with more thoroughly. There are two major benefits to this book, as I see it. First, it mixes personal experience with explanatory detail in a very readable way. Some of the background observations tend towards the technical, but they are offered in a straightforward and readily understandable way. The book also offers some guidance on legal and financial matters (for sufferers in the United States), thus adding another dimension to its more practical aspects. This book strikes the perfect balance between specialised medical description, advice for sufferers, ordinary everyday narrative, and emotional involvement. Second, and perhaps more important, is the fact that this is a very positive, optimistic book. It clearly gives the message that schizophrenia is treatable. While it cannot actually be cured, substantial recovery is achievable. With treatment matched appropriately to the individual, a sufferer can go on to lead a very full and rewarding life, with the condition downgraded to little more than an occasional inconvenience – I certainly wasn’t previously aware that such a positive outcome was possible. All these features make this book highly suitable for a variety of readers, including individuals or families affected by schizophrenia (or other mental health conditions). I would also suggest Me, Myself, and Them as a useful resource for teachers, tutors and lecturers, whose classes may include students with the kind of problems described. This book may also be useful for other community workers (youth leaders, clergy, etc.) who may, from time to time, encounter sufferers of this condition. And, of course, this book would be invaluable for anyone who wants to get away from popular misconceptions and gain a better-informed understanding of what schizophrenia is. Me, Myself, and Them: A Firsthand Account of One Young Person’s Experience with Schizophrenia by Kurt Snyder, with Raquel E Gur and Linda Wasmer Andrews, is published by Oxford University Press. ‘Care in the Community’ is the expression used in Britain for the policy whereby residential psychiatric institutions are either reduced or eliminated, with sufferers of mental health disorders being cared for in their homes with the support of community mental health services. Similar policies known by various names – e.g. ‘Deinstitutionalization’, ‘Community Release’, etc. – have been followed in many other countries, including the United States. In various comments I have made, I’ve tended to speak in favour of the policy – while also acknowledging that it is not without its problems. Given my particular interest in children’s psychiatric services, I have argued that it is far better for a child suffering with depression (for example) to be cared for in as normal and homely an environment as possible, rather than being ‘locked away’ in an institution as though he or she were a young offender. In my blog of 21 February 2011, I reviewed Patrick and Henry’s Cockburn’s book, Henry’s Demons (published by Simon & Schuster). Patrick Cockburn is particularly vocal in his criticism of ‘Care in the Community’. He describes the expression as ‘one of the most deceptive and hypocritical phrases ever devised by a government’. As the old psychiatric institutions were closed down in the 1980s and ’90s, Cockburn argues that those patients who had known some level of protection in these places were suddenly flung out onto the streets to become ‘sidewalk psychotics’. I have some sympathy for Patrick Cockburn’s position. After all, he has faced the difficulty of trying to secure the safety and effective treatment of his son Henry, a sufferer of schizophrenia, in a world of what he calls ‘couldn’t care less in the community’. Indeed, Cockburn presents a persuasive argument, seeing the closure of many psychiatric hospitals as nothing more than a money-saving measure leading to ‘cruelty and unnecessary misery’. It is, of course, perfectly true that community-based psychiatric services are often poor to non-existent (depending on region), and that many troubled people are left neglected. But just take a look at The Light in My Mind by Joyce Passmore (published by Speak Up Somerset), or my own book, Delivered Unto Lions (published by CheckPoint Press), to see the other side of the coin. These are reminders of the horrors of institutional ‘care’ in the recent past. Surely, whatever the failures of ‘Care in the Community’ might be, we cannot wish to return troubled people (young or old) to these repugnant places of incarceration. It is also the case that we have been seriously misled if we are to believe that residential psychiatric care no longer exists. It is true that the larger Victorian-style asylums have gone, as have many of their associated children’s units, but that is not to say that in-patient mental institutions have completely disappeared. I was very surprised to discover that there are roughly seventy-five children’s and adolescents’ residential mental units – run by the NHS (National Health Service) – in the UK today (plus several more privately run units). My hope is, of course, that these units of today are more caring and empathetic places than the ones that existed in the past. But given that their existence is hardly common knowledge, what happens inside them – good or bad – is hidden from our view. And this, I think, brings us to what might be the central issue. These places are hidden, and maybe this is what we as a society prefer; we don’t want the mentally and emotionally disturbed living among us. Perhaps this is why many of us don’t like ‘Care in the Community’. Maybe we would prefer damaged and troubled individuals – adults and children – to be shut away where we can’t see them. It isn't nice to think about these things, so perhaps we prefer the easy option of not having to – that is, until we or our families are affected personally. In this time of austerity, when already hard-pressed services are likely to face further cuts, I would dare to suggest that ‘Care in the Community’ can still work, and work well, but only if we as a community actually start to care. After all, even in hard times, we are perfectly prepared to do our best in supporting the people we care about. 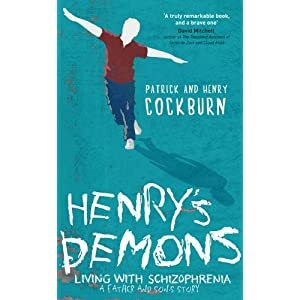 Henry’s Demons by Patrick and Henry Cockburn (published by Simon & Schuster) tells the story of a family’s testing experience of schizophrenia. Henry (one of the co-authors) is diagnosed with this condition in 2002 at the age of 20. While an art student in Brighton, Henry’s behaviour rapidly becomes more eccentric and hazardous, until he ventures, fully clothed, into the sea at Newhaven. This leads to his admission, as a mental patient, to the Priory Hospital in Hove. Parts of the story are narrated by Patrick Cockburn (Henry’s father) in a considered documentary style. He interweaves explanatory details with narrative account, but what is immediately striking is how little any of the background information on schizophrenia contributes to his (or the reader’s) understanding – the reason for Henry’s development of the condition largely remains a mystery (though cannabis use is heavily implicated as a possible cause). And so the reader is drawn into the anxiety and bewilderment associated with the situation. Other parts are narrated by Henry himself, in an almost hurried, but extremely arresting, style. He talks of experiencing the onset of his condition as a spiritual awakening, with his perspective on the world becoming significantly altered. As some of the events described take place in Brighton – somewhere I’m reasonably familiar with – I personally find it fascinating to see particular experiences unfolding against recognisable backdrops. For instance, there’s a vision of the Buddha on Brighton beach and the planting of a banana tree outside the Concorde 2 music venue. This locatedness – whether in Brighton, Canterbury, Youghal (in Ireland), or elsewhere – gives an additional tangibility to these occurrences. As the story unfolds, via one or other of the narrators, a growing sense of the enormity of Henry’s condition becomes apparent. There is no quick fix for what had happened; in fact, there is no fix at all. What is more, Henry himself is not always convinced that he has a problem, and so his willingness to take his medication (olanzapine, clozapine, etc.) is intermittent. When he takes it, his delusions and erratic actions are somewhat controlled (though not reliably so); when he doesn’t, he seems to positively revel in extreme and disturbing behaviour (climbing to great heights, walking close to railways lines, running naked through snow, and so on). What Henry doesn’t necessarily realise, but what becomes clear to his family (and to the reader), is that this is a life sentence. One particularly valuable service this book does is to underline the injustices associated with mental health problems, especially schizophrenia. Various truths are highlighted, including the fact that the media often demonise sufferers as violent (statistically, very few are), that society in general often treats them with (at best) disregard, and that sufferers are far more likely to be dismissed from their jobs than if they had a physical condition. It is also pointed out that, on occasions, sufferers placed in hospital wards can be allowed less fresh air and exercise than would a convicted offender. Given the downbeat quality of the story and many of the associated observations, it is tempting to wonder if there’s any chance of the book ending on a positive, uplifting note. I won’t give anything away, but it I will say that the reader does not finish the final chapter with a sense of desolation. Instead (for me, anyway) there is a sense of worthwhile insight bordering on enlightenment. What Then and Where Now? Sometimes as I prepare to write my blog I start to wonder if there’s anything left to say. But then some little thing will happen that makes me realise that there is nearly always something to say. This week, two questions have come to mind: (1) ‘What then?’ and (2) ‘Where now?’ I’ll deal with the ‘What then?’ first. Thanks to the wonders of social networking, I received a message this week from one of my old school classmates from the mid-1970s. This was someone I knew immediately before I experienced the events that ‘inspired’ my novel Delivered Unto Lions. She told me that, as far as she knew, I had just ‘disappeared’ from school with no explanation. Having become aware of my book, she now realised what had happened – that I’d been taken away from school (and home) and placed in a psychiatric unit because I was depressed. This made me think of three other children who went to that same school who were also (at different times) ‘spirited away’ to the very same psychiatric institution. I didn’t know any of them while I was at that school, but I got to know them at the institution. This makes me wonder whether their sudden absences went unexplained in the same way that mine did. After all, I certainly hadn’t been aware of anyone ‘disappearing’ like that, but at least one of those ‘disappearances’ had happened before mine. It is a horrible thought that, on certain (comparatively rare) occasions, children could simply be plucked out of their schools almost unnoticed. Their friends would wonder what had happened to them, of course, and no doubt some vague words of non-explanation would have been offered. But unless a child eventually returned to his or her school (some children did, some didn’t), life for everyone else would just go on, and that child would be gone and (in the end) virtually forgotten. I have been greatly encouraged by the shift towards Care in the Community which began in the late 1980s, and which by the mid-’90s had seen many of these old children’s units closed. Care in the Community has its critics, of course – and often for good reason – but I tend to focus on the idea that a child with depression, anxiety, or some other similar condition, is far better off in as normal environment as possible, rather than being ‘incarcerated’ in a clinical and often hostile mental unit. The hope is that things are far better these days, and that far fewer troubled children get institutionalised. But how can we be sure of this? The fact is that, prior to the rise of Care in the Community, very few people were aware that it happened anyway. So, if it was still happening today, would we notice? This may sound like I’m being a little alarmist. Perhaps I am. But what prompts this is what I've found (which isn't much) from my attempts to discover exactly what does happen today. Unless you are a mental health professional, your are unlikely ever to have come across the Royal College of Psychiatrists' directory of children's units. This, however, lists all the child and adolescent mental health in-patient units in Britain and Ireland – and there are actually quite a lot of them! I'm not going to start flinging wild accusations about. My hope (and my belief) is that these present-day units are far more compassionate and empathetic places than the ones that used to exist. But they are still well-hidden. Unless you go looking for these places, you'll never know anything about them. My book is about exposing a hidden world from the recent past (and Wikipedia helps too!). But there remains a hidden world in the present. What I would like to see is more transparency, so that society as a whole – as well as healthcare providers – can scrutinise current practice and ensure that it is just and caring. Lauren Slater is a psychologist who obviously enjoys a colourful turn of phrase. 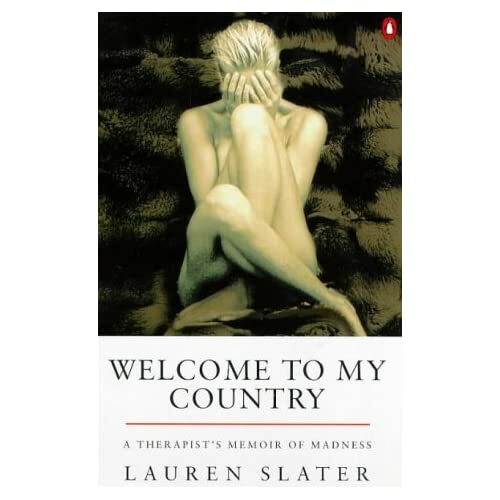 In Welcome to My Country (published by Penguin), Slater recounts her experiences of working at a clinic in Boston alongside the schizophrenic, the chronically depressed, the sociopathic, and the otherwise troubled. She positively revels in vivid description, describing one patient as having ‘skin the color of deep coal’, another as having a spine ‘standing out like a string of pearls’, and yet another as having a ‘voice as bleak as a British moor’ (though, given the context of this last phrase, I can’t help wondering how many British moors the author has actually seen!). This very much underlines the fact that this is not a textbook containing dispassionate case histories, but an experiential account of engaging with mentally and emotionally disturbed individuals. Slater’s academic grounding at Harvard and Boston Universities has not fully prepared her for suddenly entering a foreign land populated by people who seem to experience reality very differently. This is a world where women can also be paintbrushes, where spaceships can rest on people’s stomachs, and where intimate relationships can be maintained with albino girls in the sky. It is among disparate individuals with disparate delusions that Slater – uneasy and occasionally offended – has to conduct group and individual therapy, encouraging patients out of their bizarre individual world experiences into a more common shared world experience. As Slater’s story unfolds it becomes apparent that she often succeeds in entering into the worlds of her patients – even when those worlds remain stubbornly unintelligible. She comes to empathise with her patients, even when initially revolted by some of their characteristics. This is a very striking aspect of the story, especially given her admission of how little confidence she often has in formally understanding her patients’ needs. Despite Slater’s robust theoretical knowledge, much of what she seems to do in therapy – in terms of procedure – is little more than trial and error. Slater’s strength (and her vulnerability) seems to lie in her ability to empathise. Indeed, aspects of her patients’ stories stir up personal memories and emotions for her, leaving her pondering on the content of therapy sessions long after she has finished work for the day, and forcing her to confront certain aspects of herself. Slater even expresses the general observation that the mentally disturbed sometimes ‘force you into things you’d rather not see, not say.’ And she expands on this by confessing that, in knowing certain patients, she finds herself returning to a state of shame followed by emptiness. What is so disarming about this book – and what only gradually becomes apparent – is that Slater is personally familiar with psychological torment. It is this which finally gives contextual meaning to the entire book in an exquisitely moving final chapter. Welcome to My Country is a beautifully written memoir, expressing well-informed insight through a fusion of imagination, poetic language and technical knowledge. An extraordinary book. The speech on multiculturalism, delivered in Munich by British Prime Minister David Cameron on 5 February 2011, has been generating a good deal of discussion in the press. Comments like ‘We need a lot less of the passive tolerance of recent years’ have gathered a good deal of support from some papers (e.g. The Times) while being greeted with suspicion by others (e.g. The Guardian). Cameron was, of course, primarily criticising alleged tolerance of one very particular and small subculture, i.e. ‘extremists’ of the Islamic faith persuasion. But multiculturalism (depending on how you define it) encapsulates far more than this one single issue. So what does multiculturalism have to do with the usual topic for discussion on this blog, i.e. matters related to mental health? The answer to that lies in the issue of ‘difference’. Difference of the cultural variety may not seem obviously related to mental health. When presented with the word ‘culture’, I suspect many of us will think either of ‘high culture’ (e.g. opera) or something vaguely connected with ‘national culture’. But many groups have their own cultures, such as families or members of a particular profession. And other groups are often seen as though they were a culture, such as the so-called ‘disabled community’. Society, very broadly speaking, can sometimes appear to regard people with mental health problems – or past sufferers of mental health problems – as if they were an identifiable cultural group. In this way, a whole swathe of people with little or no connection to one another get marked out as ‘different’. Cameron was not, of course, talking about mental health. But he may as well have been. Because many people with present or past mental health difficulties are marked out as different by society (as are many people of certain national, ethnic or faith backgrounds) they are not really welcomed into the mainstream. As such it is only natural that some should choose to live separately from those around them. And by segregating themselves, they become even less welcomed by the mainstream, and so they segregate themselves further. What has prompted me to post these observations is hearing the story of a physically disabled woman (whom I will not identify) who is so fed up with the verbal abuse she receives when venturing out into public areas that she often avoids it, feeling very uninclined to ‘integrate’ with the mainstream. This is, no doubt, an experience she has in common with people with many conditions – mental and neurological, as well as physical. Cameron says, ‘We need a lot less of the passive tolerance of recent years.’ Given that so many people, through no fault of their own, are not tolerated by much of society – passively or otherwise – leads me to conclude that this was a very unfortunate statement. Clearly I am interpreting it in a way that was not intended, but surely politicians should be aware that the ‘enemies’ they target are not always the ones who take the hit. I am sure this is not what Cameron wants, but many people will get (and, apparently, have got) the message that it’s good and proper to be intolerant of difference. So when it comes to people with mental, neurological or physical difficulties (along with many other people), I say that what we need instead of ‘passive tolerance’ is ‘active acceptance’. In some recent radio interviews (and a YouTube video) in which I have discussed my book, Delivered Unto Lions, I have made a number of general allegations in connection with the experiences and issues that ‘inspired’ it. I have talked about the former Merrifield Children’s Unit at Tone Vale Psychiatric Hospital in Somerset (the basis for the fictional Oakdale Unit of my book), and I have suggested that some of what I experienced and witnessed there in the 1970s was abusive. My allegations have, admittedly, been non-specific. I haven’t named names, but focussed instead on the system that allowed certain things to happen. I have criticised the institution’s reliance on drugs to treat and control its patients, along with my opinion that it was inappropriate to subject developing brains to these potent substances, and in such doses. I have also referred to excessively aggressive forms of restraint, and the isolation of children in a small room with their clothes taken away from them (and I haven’t always remembered to point out that these things were occasional rather than regular events). I could have said more, of course, but daytime radio may not be the best forum for a discussion on the horrendous response to incidents of sexual abuse (but such things are covered in my book). What amazes me is that no one (as far as I am aware) has yet come forward to defend Merrifield Unit, or children’s psychiatric units more generally. And no one (again, as far as I am aware) has yet emerged to condemn my book as sensationalist fabrication (though, if anything, I consider it understated in places). It is true, of course, that my book is only a modest seller and that my radio interviews have only been broadcast on local stations, and have not therefore enjoyed an especially high profile. But I have certainly heard from people who confirm the picture I have painted, so there is clear evidence that what I have said has reached at least some of those interested in the topic. What I have said in my interviews is, of course, the truth. And the content of Delivered Unto Lions is a representation of that same truth. But I recognise that there are at least two sides to every story. So, where is the case for the defence? Why hasn’t anyone challenged me? It would be nice to think that those concerned (where they are aware of what I have said) have recognised the validity of my arguments and accepted that I am in the right (in which case an apology directed at former child patients would be an appropriate response). But it would be both naive and conceited to believe that that is the case. So, what is the reason for the silence? Maybe those who disagree with me simply think the issue isn’t important. In some ways it is rather foolish of me to invite a challenge – I don’t actually want to be challenged. But the issues that lie behind my book are important ones, and that makes the silence from certain quarters ‘deafening’. Everything I have written and said on the subject is concerned with exposing the ‘hidden world’ of children’s mental health care in the recent past, but it seems that the former ‘rulers’ of this ‘hidden world’ are doing all they can to stay hidden – which is hardly encouraging if the same diffidence applies with regard to the current state of child psychiatric care. I am aware that I am being unusually provocative here, and I continue in that vein by ending on a similarly provocative note. I have asked, ‘Where is the case for the defence?’ Could it be that there is no possible defence?